Pro Ex has multiple blending units set up on site. 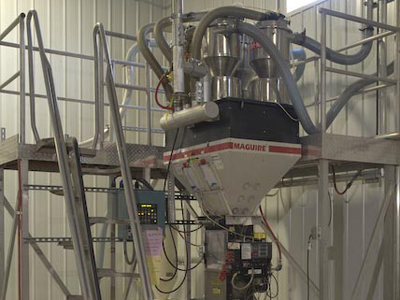 This equipment is utilized to ensure that the material is properly blended and formulated to meet your requirements. Plastic pellets, repro, regrinds, and various components are blended together in specific proportions prior to entering the process. The exact composition of this blend is critical in the final product composition and quality. Consistency in the composition of the batch is a key element in quality control of the final product.